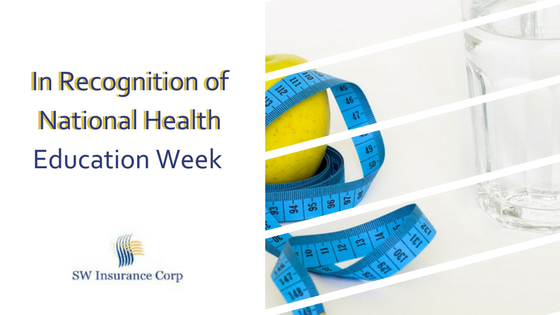 In Recognition of National Health Education Week | SW Insurance Corp.
For the past 12 years, the third full week of October has been designated as National Health Education Week. This year, it falls from October 16 to October 20. Each year, health educators use this week to draw attention to a major public health issue, and the impact that good health has on our daily lives. This year, the emphasis will be placed on the link between technology and health, as well as, environmental and community health. In recognition of National Health Education Week, we would like to focus on employee wellness programs and how these are good for both your employee’s health and your business. Since the introduction of the Affordable Care Act, wellness programs have taken off in corporate America. Businesses are becoming more health and insurance conscious. Currently, over half of the companies in the United States offer some form of initiative program with their health insurance. According to the Rand Corp, “wellness programs are now a $6 billion a year industry”. So why exactly are businesses implementing these provisions? That is actually a two-fold answer. First, employers are realizing that preventive care, such as check-ups and screenings, keeps their employees healthier. This, in turn, can lower the costs of healthcare that is placed on the employer. Ultimately, by spending some money upfront, the employers are keeping their employees healthy and saving more money in the long run. For instance, if a wellness program can help reduce an employee’s weight, that can save the company money. A one-point reduction in Body Mass Index (BMI) can save the employer about $1500 a year. Lost sick days is another way that workers’ health impacts business revenues. It is estimated that lost work due to illness or injuries cost over $500 billion a year. By putting in a wellness program, employers can save this lost money by keeping their employees healthy and at work. Another aspect of the wellness program that is really catching on is the wearable device that helps track your health. Insurance companies are actually encouraging these items to help improve their customer’s health. Wearable devices such as the Fitbit got their start with the old-school pedometers that monitored how many steps a person took each day as a means of encouraging people to get up and be active. These new devices can go even further, allowing all physical activity to be logged along with the number of calories burned. They can even track your sleep patterns and alert you to issues such as snoring which may be caused by more serious problems like sleep apnea. In a time when people are becoming more health conscious, corporate wellness programs make a great deal of sense. National Health Education Week is the perfect opportunity to enroll your staff in a wellness program. Wellness programs give that added incentive to take charge and improve your health, something that can help both your employees and you, the employer overall. Many employers put together incentive programs each quarter to encourage their employees to pay attention to their health and financial wellness goals. For example, at SW Insurance Corp we talk with employers about the different programs that they might implement. First quarter of the year everyone is on the exercise bandwagon. Community gyms are all advertising special rates for joining. Many of the major medical insurance companies have reimbursements schedules for gym memberships. Contact the gyms close by your office and see if they would give your company a “special rate” and then post flyers and send out encouraging emails to your staff. You can also run a contest for most pounds lost or most body fat loss with gift certificates given out or a grand prize of a FitBit type of device. Second quarter you might choose a different focus and contest. Perhaps bring in a business owner that is close by that can teach Yoga or daily stretches twice a day. Or you can bring in an expert on how to properly set up the height of your desk chair to be more ergonomically correct. Third quarter the weather is usually beautiful, maybe team up with fellow co-workers for walk-a-thons. With a grand prize of a half day off from work, with pay, that they can use anytime during the year for the team that logs the most miles for the quarter. You could give the prizes out weekly, monthly, or quarterly. The more often the better for building teams that work and play together. Fourth quarter is usually the busiest quarter and has the most holidays. Your employees’ focus is all over the place. One great idea is to bring in a gift-wrapping team and invite your employees to bring in their holiday gifts to be gift wrapped while they work. It will be a huge savings of money and time for your teams. Find ways that encourage your employees to take better care of themselves by engaging at least quarterly with events. They help build strong working relationships and keeps them happy about who and where they work. They feel appreciated, and appreciated employees will give 110%. Contact us at SW Insurance Corp , 720-344-1105 to have a conversation about what you can do to encourage your employees to better health.